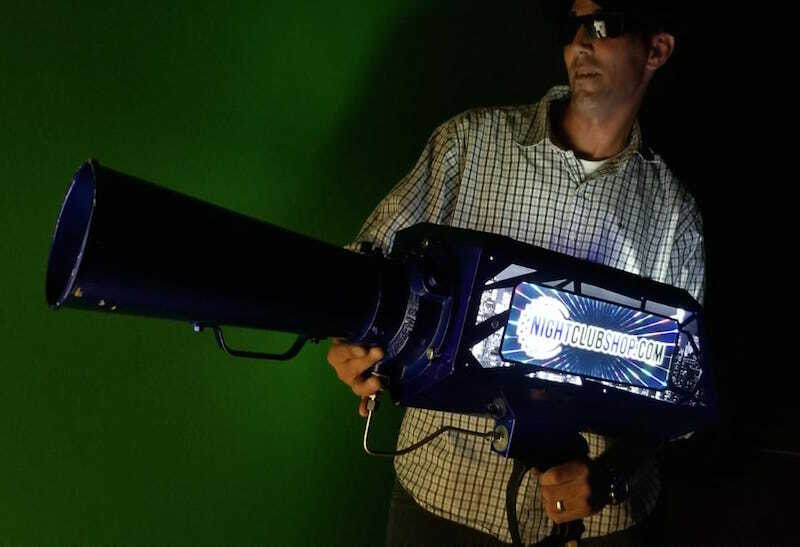 Nightclubshop.com's newest and most exciting addition to our special effects arsenal, The HypeMakerz VIP Confetti Cannon CO2 Gerb Launcher/Blower is rapidly becoming one of our most requested SPECIAL FX products, and a true favorite among some of the worlds most renown and exclusive Nightclubs and Venues! highly anticipated Confetti effect is to have a high output, highly effective, and portable Confetti Blower/Confetti Machine like this! 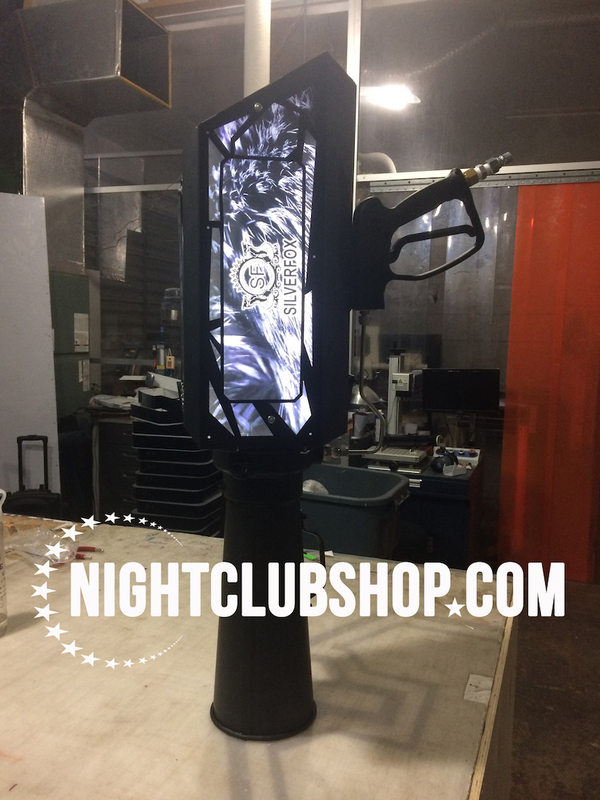 Comes in your color powder coat paint color and LED Light up area is branded with your Art or Logo. 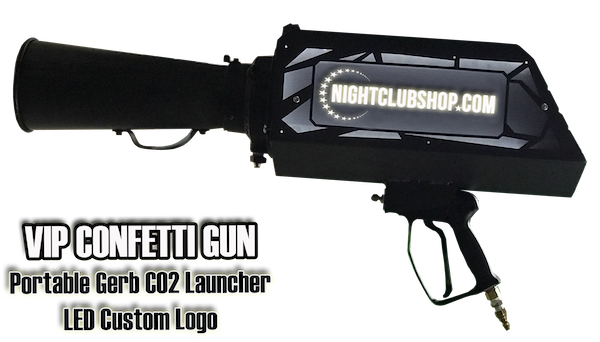 Nightclubshop's "Hypemakerz VIP Confetti Cannon CO2 Gerb Launcher" is Custom Branded and Custom made for your Venue. 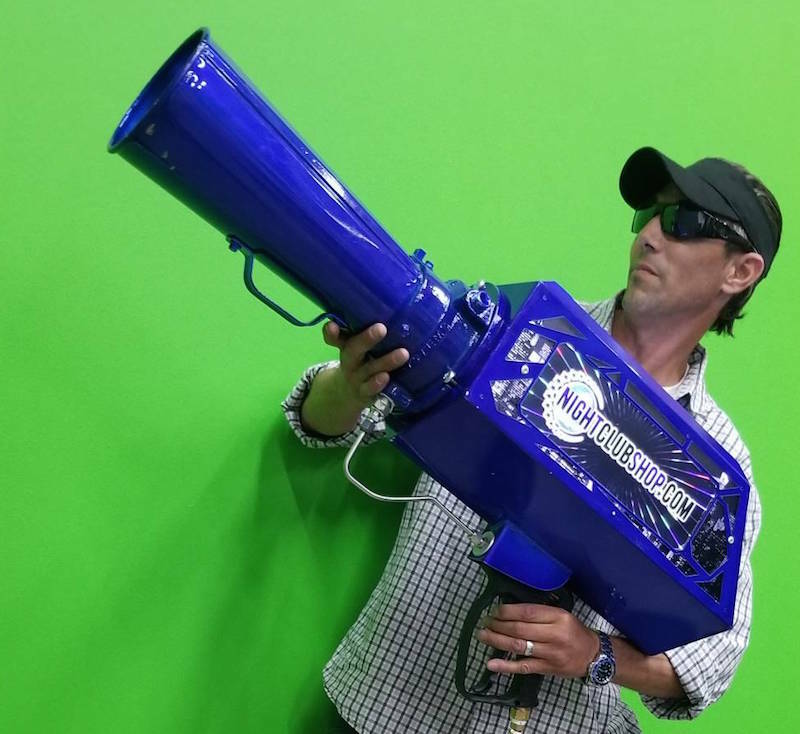 This Confetti Blaster is easy to set up, use and maintain. This Portable Confetti Gerb Continuous Blower works just like the Large Professional GERB Blowers at half of the price and it is powered by a CO2 Line/Tank using a Quick Connect hose and Quick connect adaptors. 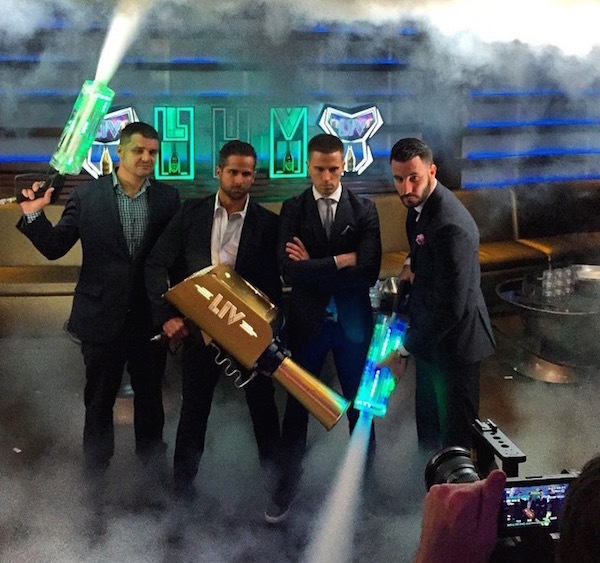 The "Hypemakerz VIP Confetti Cannon" can hold up to ten pounds (10Lbs.) of Confetti inside of its Payload Hopper and as you pull/squeeze the trigger, the Confetti will rapidly launch a distance of up to 50-75 feet in the air. Your crowd will absolutely go wild with this unbelievable confetti wall visual effect! SPECIFICATIONS: This Confetti Gun is most commonly operated using 20Lb. CO2 Tanks for portability and this unit comes with a 10 Ft. High Pressure quick-Connect hose. You can use either 20-lb.,50-lb., or 75-lb. liquid siphon CO2 tanks to operate this continuous flow Confetti Launcher/Blower machine. You will need to buy or rent the CO2 tanks in your hometown and have them refilled on a regular basis. The amount of CO2 you use per shot dictates how long the effect will last. This Confetti Launcher will work with both, Tissue or Metallic Confetti. Increase bottle sales revenue by giving your big spenders the chance to blast away. her confetti cannons, which are hard to transport, this gun is easily mobile with the same powerful effect of much larger cannons. Uses 20lb CO2 tanks, and comes with a 10 ft. high-pressure hose. Have you ever seen the Worlds most popular MEGA Clubs using larger than life VIP Bottle Presenters, LED Birthday Cakes, Led Cryo Cannons, Awesome Special Effects, and really powerful confetti cannons? As you research and look up some of these products and items you realize that they are well outside of your Nightclubs budget and way to expensive to purchase outright? However...some of these products are the Key to success when used properly, Building an exciting experience and creating that "WOW" Factor that you and your Patrons are looking for! These higher end VIP Products pay themselves off in one evening in large Venues or Nightclubs, and 4-5 evenings in smaller Venues/Clubs...after that it is pure profit for the Club and an unforgettable experience for the patrons! Win-Win for both! 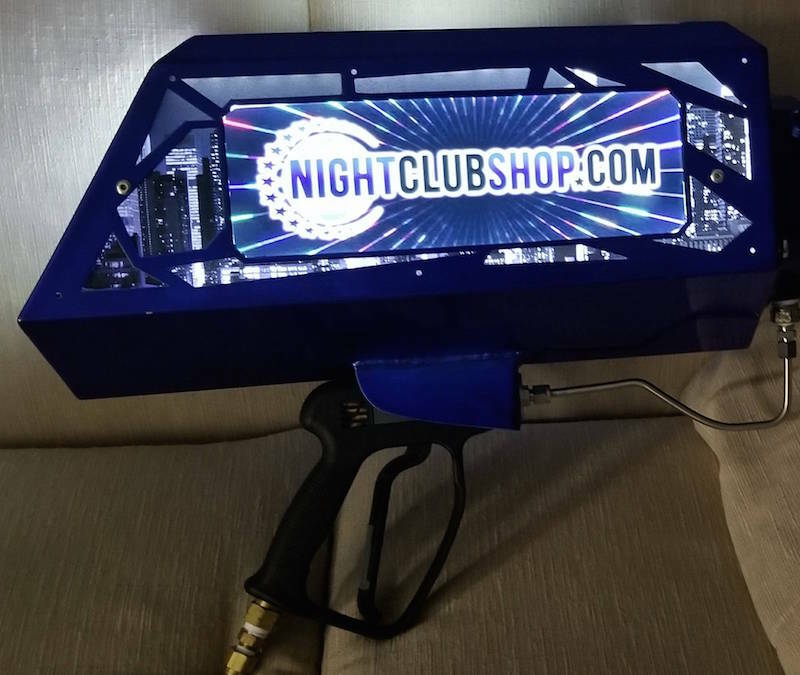 Nightclubshop.com is making the impossible, possible for small and mid-sized clubs to give their patrons the same VIP Experience and unbelievable feeling that the large and MEGA-CLUB's clients pay tens of thousands of dollars to enjoy. With cutting edge technology and branding capabilities we offer you the best way to set yourself apart from your competitors. 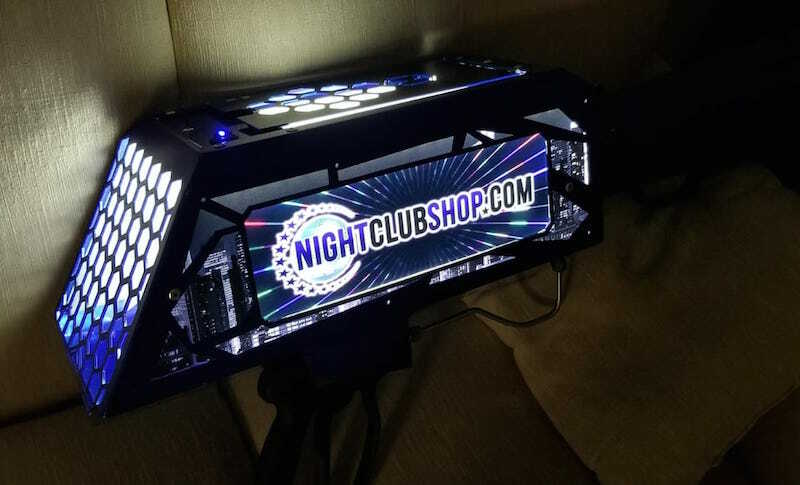 Nightclubshop and Hype makerz Custom uses only the highest quality materials and hardware, as well as highly skilled craftmanship to create and custom build these products, and we also offer the best guarantee in the business when you invest in these VIP products and services. 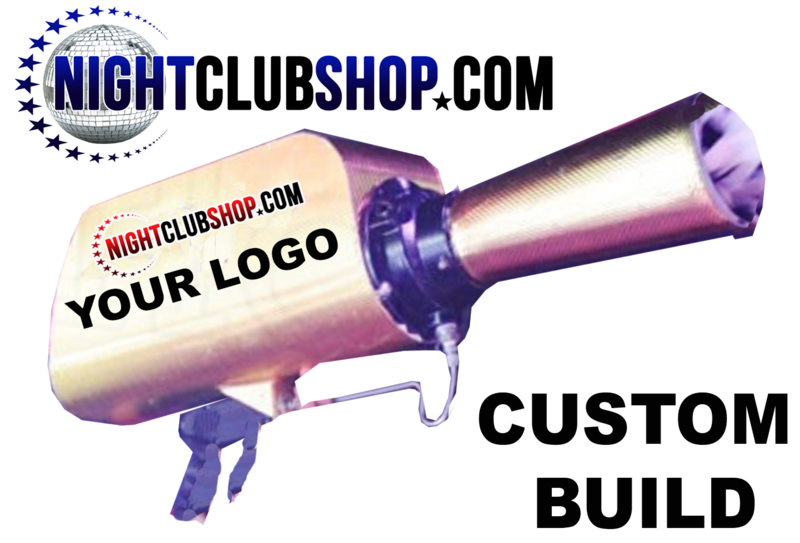 Option 1: You can purchase this VIP CO2 Confetti Cannon outright, We will customize it for you with your Name, Logo, Text, or art, and you will receive a 1 year warranty on craftsmanship, and any manufacturer defects. 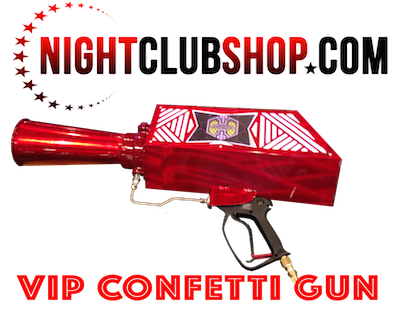 Option 2: You can purchase our Nightclubshop Monthly Service Plan which makes this VIP CO2 Confetti Cannon VERY affordable. HOW IT WORKS: You pay an Initial Down Payment which is reasonable, and then you pay a monthly charge debited directly from your checking account on the first of the month with your first payment starting the month following your purchase. 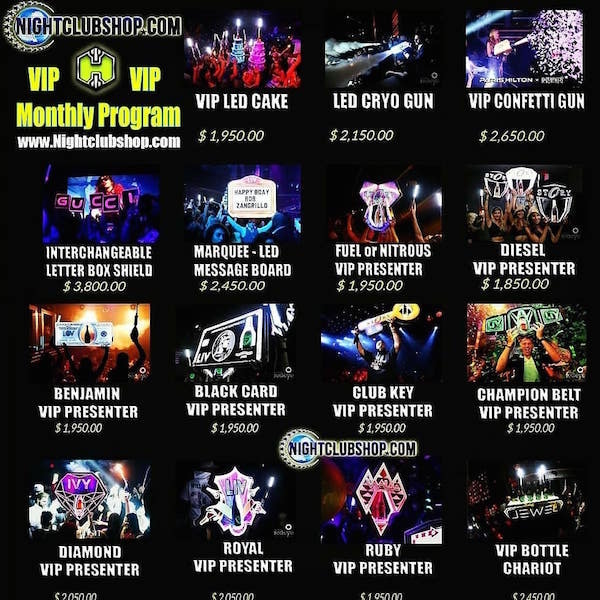 This is a Nightclubshop monthly service plan designed to help smaller businesses ensure that their VIP Service products will never be out of service or unusable due to an accident whether your fault or not. 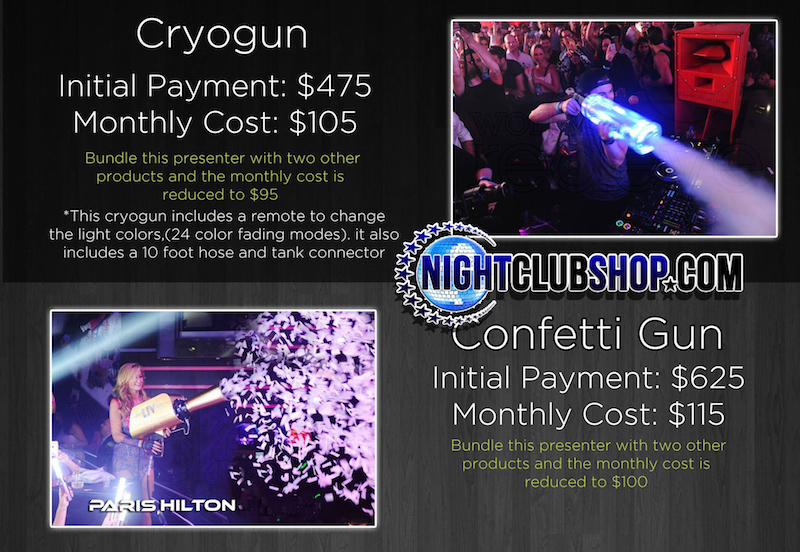 With this Nightclubshop monthly service plan, you get the VIP CO2 Confetti Cannon, LED Cryo-Cannon, or VIP Bottle Service Presenter of your choice, or you can choose and design your own custom made presenter and if 3 months down the road you drop it or it breaks, we will fix or replace the unit within 2 weeks of receiving it.You pay to ship it back and forth to us for repairs. Your monthly service plan ensures that you don't have to pay another initial down payment for your Product or Bottle Service tray as long as you pay the monthly service plan fees. If for any reason you would like to cancel the monthly service plan there are no penalties to cancel the service as long as you return the product to us before your next monthly service plan due date. Once we receive the CO2 Confetti Cannon, or Bottle Presenter back in our warehouse we will stop your monthly fees with no cancellation fees or gimmicks. If you should want to purchase a few of our Nightclubshop monthly service plan products/items, then we will give you a discount for multiple products. This way you can have a LED Birthday Cake, a VIP Bottle Presenter or two, a LED Cryo-Cannon and a VIP Confetti Cannon at your disposal for only a few hundred dollars a month on a service plan.